You don’t have to do much to make a Christmas movie work—just ask the lovely folks at Hallmark who start their all-Christmas movie playlist before Halloween. The themes of family, giving, music, food and joy are already there and all that needs to be added are a couple of characters who need to be reminded of how it’s the most wonderful time of the year. Some mistletoe, cookies, and reconciliation, maybe a reminder that family is more important than ambition, maybe a sentimental relic of the past, and audiences are more than happy to smile through their tears of nostalgia and warmth. But “The Christmas Chronicles” keeps getting in its own way with a patched-together story, raggedy tone, thinly imagined characters, and weak humor (Santa explains that he doesn’t really say, “Ho Ho Ho”—that’s fake news). We meet the Pierce family through a series of clips from home movies made each year at Christmas. Kids grow up, gifts are opened, and ugly Christmas sweaters are displayed. These are brief snippets, a simulation of smudgy homemade authenticity, and yet they are of higher quality than the rest of the movie. The home movie flashbacks end in 2017, and then we learn that this will not be a merry Christmas for the Pierce family, because the loving dad (Oliver Hudson) we saw with his wife and children has died, and this will be the family’s first Christmas without him. The loss has left the family members anxious and isolated. Mom (Kimberly Williams-Paisley) is working hard to support the family and is called in at the last minute for an extra shift on Christmas Eve, leaving the children at home alone. Teenager Teddy (Judah Lewis) is angry, lashing out at his sister and spending most of his time with the kind of friends who stir up trouble. His younger sister Kate (Darby Camp) keeps re-watching those home movies, and uses her dad’s old movie camera to make her own, including a video letter to Santa. A glimpse of a red sleeve in the corner of one of the home movies inspires Kate to try to capture Santa on film and she uses the threat of showing their mom a video she made of Teddy and his friends boosting a car to persuade him to help her. 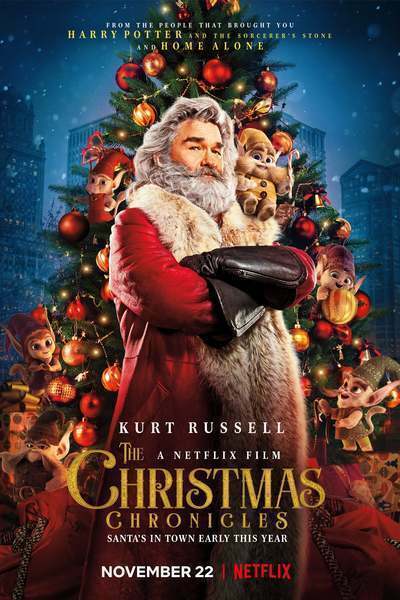 Sure enough, Santa (Kurt Russell) shows up. Kate and Teddy end up stowing away on Santa’s sleigh and when he discovers them he crashes in Chicago. It's up to them to get Santa and Christmas back on track. “The Christmas Chronicles” throws at us every Yuletide goodie it can think of—holiday music, Santa, CGI elves, runaway reindeer, the toy shop at the North Pole, a tender family reconciliation, and that perfectly meaningful gift that makes everything better. Mrs. Claus appears in a completely non-surprising, one might even say inevitable cameo. The scenes of flying are well done and there’s a pretty good musical number with Kurt Russell, who has played both Elvis and an Elvis impersonator in films, rocking it out in a prison cell, backed by Little Steven Van Zandt and the Disciples of Soul and a trio of sassy back-up singers (don’t think too hard about why they were arrested). But that cannot make up for a meandering script that drags us through half a dozen locations, losing more of its momentum at each stop. Even its Christmas-ology is muddled, with delivering presents and being a "true believer" more important than kindness and sharing. If this movie comes your way, you’d better watch out.